Toenail Fungus: A Health Insurer's Worst Nightmare? You are here: Home / Foot Care Blog / Laser Nail Treatment / Will Toenail Fungus Make My Insurance Rate Go Up? Sandy Kleffman, writing for the Contra Times, tells the story of Ralf Burgert, an otherwise healthy 43-year-old nurse practitioner who happened to come down with a common toenail fungus infection that he treated with a prescription of Lamisil. 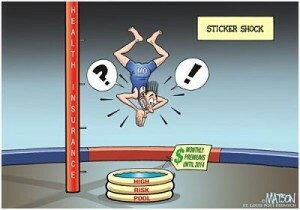 When the San Rafael resident applied for health insurance on the independent market, he was informed he’d have to pay a 50% jump in premiums for being in a “high risk” pool! “The things that people have been denied for raise the question if simply living is a pre-existing condition,” said Anthony Wright, executive director of Health Access California, a consumer advocacy group. All this is set to change in 2014 when new laws are set to go into effect and state exchanges are to be set up with a $761 million federal allowance. However, for now, it’s like the Wild West. Insurers’ competition is based on their ability to deny coverage or charge more than what they’re paying out in claims, according to industry insiders. Group plans are the best way for people with pre-existing conditions to achieve some level of care. At least 21 million Californians are covered through employers and enjoy the bargaining power that such a large insurance pool carries. As the size of a particular group expands, the risk is spread out more, so the cost of health care for a few really sick people is balanced out by the hundreds of people who are generally quite healthy. Why Is Toenail Fungus Such A Concern For Insurers? While many people enjoy employer-funded health care in this country, problems like toenail fungus are still a concern for the 2.5 million people who rely on the individual market. In the smaller individual health care market, costs are determined through estimates of the cost of treatment, medications and doctor’s visits. Sometimes minor conditions can lead to bigger problems. For instance, diabetics with toenail fungus may suffer deformity, difficulty walking, secondary infection, widespread foot fungus, athlete’s foot, ulcers, gangrene, and even amputation. According to Blue Shield of California, “Antifungal pills give the best chance of curing a severe fungal nail infection, but they cost a lot and have serious side effects. You will need to see your doctor for regular testing if you take these pills.” It’s true that drugs like Lamisil are particularly hard on the liver and require patients to have regular liver function tests while undergoing treatment. An alternative would be laser treatment for fungal nails, but insurance doesn’t cover that cost at all because they deem the treatment to be “cosmetic” — even though they acknowledge that the failure to treat the chronic condition could lead to bigger problems down the road. So, to avoid this hassle, do everything you can to avoid toenail fungus in the first place. SteriShoe is happy to be part of your fight against exposure to foot fungus.